_En VR, on reconnaît son corps dans celui de l'autre. Célia Bonnet-Ligeon, Approches en Nouveaux Médias, 15/12. _Disentangling the Entanglements. Randall Packer, thirdspacenetwork. February. _Unlocking Proprietorial Art Systems interview: with Artists, Gretta Louw, Antonio Roberts & Annie Abrahams. Interviewed by Marc Garrett 26/02. _Annie Abrahams, tueuse en série. Daniel Fohr, Choses écrites ou vues. January. _Reading as Writing, Coding as Public Performance, Daniel Temkin / esoteric.codes. 21/12. _Participar en tiempo discontinuo, Zara Rodríguez Prieto on "besides," Telón de fondo. Revista de teoría y crítica teatral, núm. 25, 2017, pp. 160-178. _Addictive Behaviours: Interview with Artist Annie Abrahams by Marc Garrett and Ruth Catlow for the debate secion on Furtherfield. _"10 9 les machines, elles, ne buguent jamais ?" Doc(k)s 4éme Série Numéro 25/26/27/28. Page 204 – 207. Edition AKENATON, Ajaccio. 2017. _The Laboratory of Networked Behavior. Randall Packer in "reportage of the aesthetic edge". 14/05. _Networked Conversations video interview by Randall Packer 13/05. _“who’s afraid of ? La vie en intelligence collective” p 41 – 50. special Yann Le Guennec, Co-incidences no 18. Revue d’arts et créations. ISBN 9781326828899. _"Can you whisperontheinternet? ", Gretta Louw on networked performances (Angry Women), LEAP #39, p172-179. _"The Personal & the Politics of Language: Digital Colonialism & Annie Abrahams’ (E)stranger" Review by Gretta Louw on Furtherfield, 08/03/2016. _Rule-guided Expression: Gender Dissent across Mediated Literary Works, Kristin Allukian and Mauro Carassai on Séparation/Separation, Ada Issue #8. _Verbal Disengagements: Translating Language Games in Annie Abrahams’s Separation/Séparation, Mauro Carassai and Renata Morresi in Translating E-Literature, (2015). Eds. Regnauld, Arnaud and Abrioux, Yves. Bibliothèque de l’Université Paris 8. _Choose Your Muse, Interview by Marc Garrett on Furtherfield, 09 2015. _"Annie Abrahams, Le principe d'incertitude", Gaspard Bébié-Valérian, MCD #78 Page 12_13. _Opening up a new zone for what formerly was called net art, Jasmina Založnik. October 2014. _Annie Abrahams: Jezik v svetu med realnim in virtualnim Pogovor z umetnico ob njeni aktualni razstavi 29. oktober 2014 ob 06:28 Pina Gabrijan. _Potrpežljivost in pozornost (Patience and Attention), DEVNIK Nov 3, Mojca Pišek. _ V performanse vložim tisto, ?esar ne razumem Interview Annie Abrahams, Tanja Lesni?ar – Pu?ko, Dnevnik 17/04. _Igor Štromajer & Annie Abrahams by Gretta Louw, BOMB Magazine April 21st 2014. _Reading club : intervista ad Annie Abrahams ed Emmanuel Guez, Simona Polvani, PAC Magazine di arte & culture. _Annie Abrahams : le web est un théâtre, Delphine Neimon, The Artchemists. _Avec le Reading Club, la lecture n’est pas un impensé Interview Emmanuel Guez et Annie Abrahams by Annick Rivoire, poptronics. _Entretien dans Infra 02 (page 20 – 23), Julie Menuet Le Her & Lionel Broye, Editions Macrosonges. _Leonardo Flores loves “A(l)lone” by Annie Abrahams, Leonardo Flores for I ♥ E-Poetry. _Trapped to Reveal – On webcam mediated communication and collaboration, in Hz #18, Stockholm. _La performance numérique, nouvelle anthropologie? Chronical by Madeleine Filippi in DIAPO #7. _Interview with Annie Abrahams by Alessandro Ludovico Neural #43 Autumn ISSN 2037-108X page 40 – 42. _ Annie Abrahams (2012) Interviewed by Christina Papagiannouli. 30 November. _ 'Training for a Better World' by Annie Abrahams Review by Michael Szpakowski published in http://humanistesvirtuals.blogspot.fr and in http://www.furtherfield.org/features Dec.
_Trapped to Reveal – On webcam mediated communication and collaboration, by Annie Abrahams, Journal of Artistic Research JAR2 Nov. ISSN 2235-0225. _Towards an aesthetics of failure Elaine Speight on the Digital Aesthetic, conference in Preston, UK. _Today I conversed with, interviewed by Filippo Lorenzin, May. _Tweet-intervista, by Simona Polvani, 16 04 – 20 04. _"The work of Annie Abrahams” by Emmanuel Guez "Writing and Performance" Page 34. - "Ne me touchez pas", Serge Bouchardon, 10 Regards sur la littérature numérique, page 33, MCD #66 Machines d'Ecritures / Writing Machines. _John Zuern on Séparation/Separation in "Where Are We Now? : Orientering in the Electronic Litterature Collection Volume 2", Electronic Book Review. _"Ne me touchez pas / Don't touch me ", Short review by Serge Bouchardon for ELMCIP’s knowledgebase , october 2011. _"Exercises in remote collaboration – Huis Clos / No Exit – (or, “how cyberformance reveals intimacy”) ", text for ISEA 211 Istanbul, Annie Abrahams, september 2011. _"Annie Abrahams’s Experiments in Intimacy" , Maria Chatzichristodoulou [aka Maria X], GENDER FORUM, Issue 31 2010, Gender and Performance, Theatre / Dance / Technology. _"La vie dans les réseaux d'Annie Abrahams", by Maria Chatzichristodoulou [aka Maria X] for Digimag 54, May 2010 translated in French for Poptronics. _"Annie Abrahams and life in networks" by Maria Chatzichristodoulou [aka Maria X], Lecturer in Theatre and Performance – School of Arts and New Media -The University of Hull @ Scarborough, for Digimag 54, May 2010. _"loK8Tr, Matthew Pioro, about the dangers and pitfalls of online collaboration" by Matthew Pioro pour Musicworks Issue 106 spring 2010 The future of radio, from web 2.0 to second life, 20-03-2010. _"Network Happy, ANNIE ABRAHAMS ‘IF NOT YOU NOT ME’ AT HTTP IN LONDON", Rachel Dainer-Best, FABRIC Art magazine, 03-03-2010. _"If not you not me - catalogue essay", Ruth Catlow, Catalogue txt pour l'exposition dans la gallerie HTTP, Londres, janvier 2010. _"Artistic Textual and Performative Paths in New Media Correlations: An Interview with Annie Abrahams", Evelin Stermitz, Fylkingen’s journal Hz #14 , 29-12-2009. _Txt included in "Special MCD edition" WJ-SPOTS #1 15 years of artistic creation on the Internet. _"Coming out of on's bubble" Entretien croisé avec Albertine Meunier par Cyril Thomas, Furtherfield, 6-08-2009. _"One the puppet of the other / L'un la poupée de l'autre: The video and the performance", Alejandro Delgado Gómez in Archives & Social Studies Vol 1 No 1 ISSN 1988-0626, 16 March 2008. _ "Panoply, Please", Marisa Olsen onr "Breaking Solitude" for Rhizome. 18-1-2008. _"NewsSeries2 - Oeuvre du mois", Corinne Welger-Barboza in "Observatoire Critique" 10 07 2008. _"Le baiser le plus long... ou pas." Troudair for Fluctuat 31-10-2008. _ Ruth Catlow "intimate collaboration", festival/seminar "INTIMACY", London on the video "l'un la poupée de l'autre" 9-12-2007. _In "Distributed Authorship, Beauty, and Ethico-Aesthetic Resonance" Kristie S. Fleckenstein, Associate Professor of English, Florida State University writes about the Annie's "Wishes" only version for the 1999 issue of Riding the Meridian. Article published in KAIROS 11.3. _In "Les Basiques : la littérature numérique" Philippe Bootz comments on SolitudeS, Leonardo/Olats May 2007. _ "Interview with Annie Abrahams" by Béatrice Bonfanti for weblogart. _ Eliza Fernbach "disturb.the.peace [angry women]" on "nice girl 2", Furtherfield.org. _Birgit Haas "Der postfeministische Diskurs" ed. Königshausen & Neumann. ISBN 3-8260-3230-6 p. 121 -125 on being human by Elisabeth Joyce. _ "Writing as a Woman: Annie Abrahams" "e-writing" article by Lisa Joyce for the Electronic Book Review. 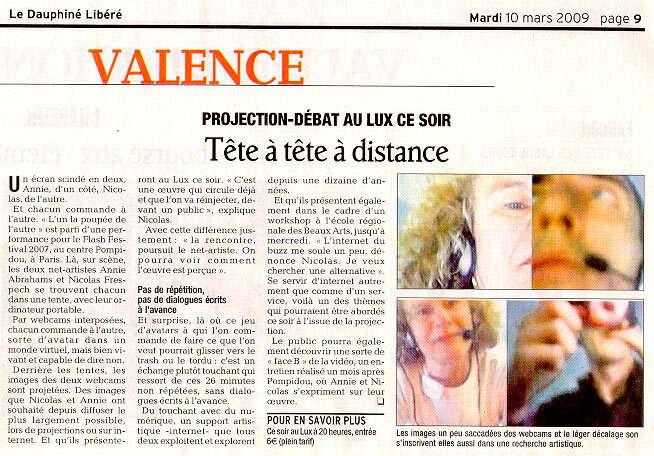 _ Valérie Méliani , 2005, "Vers une compréhension des usages émergents des TIC : lexemple révélateur des artistes numériques", in Actes des travaux du Groupe de Travail "Sociologie de la communication", XVIIe Congrès des sociologues de langue française. _ Articles on Why rock? webshow : exiwebart_project Why Rock? for Exibart by Valentina Tanni (Italian), "Jouer aux rock-stars" in Libération 10-06-2005 by Marie Lechner (français), Why Rock? At Turbulence.org  for Furtherfield.org by Mark R. Hancock, Le net art est-il rock ? on Fluctuat by Puck (français). _ Annie Abrahams. Art Nîmérik. La Semaine de Nîmes no. 250 5-02-2004. _ Une attention particulière. 'AttentionS' ! Text by Marlène Duretz LeMonde.fr Check-List vendredi 30 janvier 2004 . _ Annick Bureaud, Xavier Malbreil (french) and Lora McPhail on "SolitudeS"
_ Joan Campas on being human in The Frontiers between Digital Literature and Net.art for dichtung digital. "IT'S NOT THAT, IT'S NOT THAT, IT'S NOT THAT": READING DIGITAL POETRY, paper by Lori Emerson at "E-Poetry" 2003: April 23-26 at West Virginia University in Morgantown, West Virginia. _Pavu.com interviews anniea for P2P. _"Confrontation will never stop" by Ruth Catlow nov.2003." " in Papiers Libres, art contemporain no 28. _'The cyber-kitchen and I am (not) a work of art, problematics of collaboration', article by Cécile Petit for the site of Centre International d'Art Contemporain de montréal, section : actualités. _Presentation of 'Being human' in 'Le magazine électronique du CIAC no 8' by Sylvie Parent. _Review of 'Being human' in 'Langage et texte - espace' in 'Le magazine électronique du CIAC no 9'.